These Alexandra Neel suede booties feature zipper detail and canvas banding at the cuff, and they're on sale for $588 at shopbop.com. Looking for a cheaper alternative? 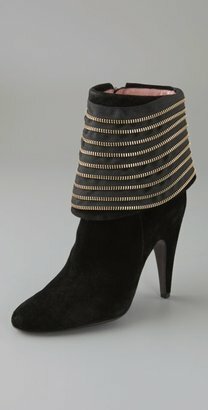 Try these Zipper Trim Ankle Boots, $32.80 at forever21.com. The zippers are edgy but the suede and soft curves of this boot make it ladylike. Love it. I actually prefer the wavy, messy zippers on the F21 version! I never do online shopping, but I saw those F21 boots on here and had to have them... I just ordered them-- they look amazing! thanks for posting them. Hopefully they'll be as wonderful in real life as they look on screen. Let us know how they work out for you!